Christ Church Ruston features high-energy musical performances that boast concert-level sound and theatrical lighting. 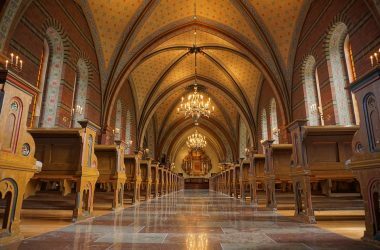 Thanks to advances in streaming video, a multisite approach to ministry is now an achievable goal for a growing number of houses of worship. 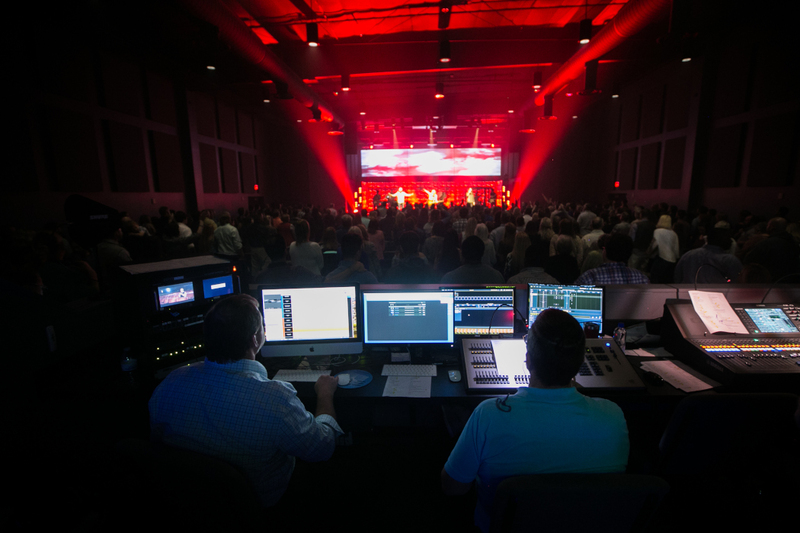 However, as these churches adopt more technologically complex AVL systems in their expansion to multiple locations, they are likely to experience some growing pains. Fortunately, an experienced integrator can help ease its church clients through the initial awkwardness of the transition to a multisite model by setting realistic expectations early in the process and delivering exactly what the client needs to realize these expectations. 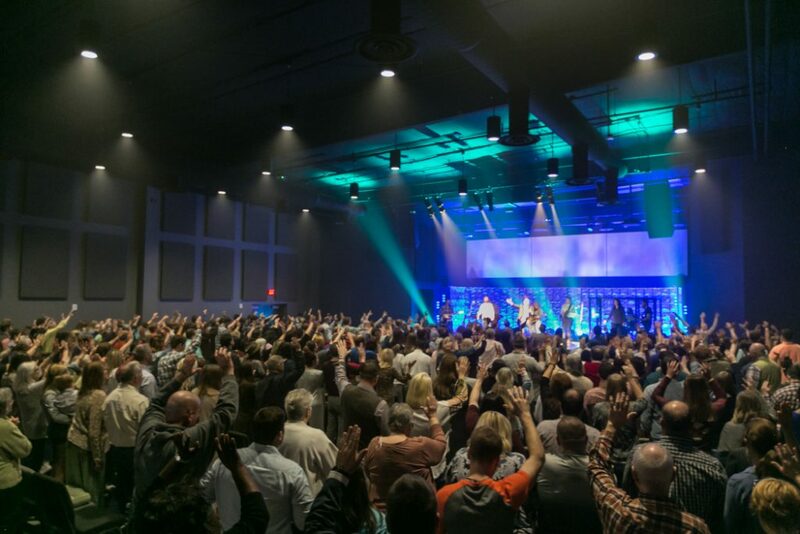 Louisiana’s Christ Church is one such house of worship that has adopted a multisite model, and, thanks to its leaders’ clarity of vision and the expertise of integrator American AVL (www.americanavl.com), it recently completed the successful launch of its first satellite location in Ruston LA. The Ruston campus was built to support Christ Church’s existing location in West Monroe LA, which has now been designated as the church’s broadcast campus. The Ruston location was a new construction, built from the ground up for this specific purpose; this meant that the building was designed with its eventual AVL needs in mind. In terms of its design, Christ Church Ruston is more or less your prototypical modern worship space. “It’s pretty much a giant box building with a blacked-out ceiling and a stage area,” R. Gwin Edwards, President of American AVL, described. Christ Church’s services open with an introductory video segment, followed by a musical performance by a contemporary worship band, which is followed by a spoken-word sermon. The Ruston campus has its own dedicated band that performs at the venue each week, but the spoken-word sermon is delivered live and in person at the West Monroe campus and streamed (nearly in real time) at the Ruston campus. American AVL had previously installed systems at the West Monroe campus, and because Edwards is a member of Christ Church’s congregation and American AVL’s main office is located just around the corner from the Ruston location, the company was Christ Church’s first pick to design the audio, video and lighting systems for the new campus. Christ Church’s leadership reached out to American AVL early in the build process for the new building, which allowed the integrator to work closely with building contractors to ensure an optimal setup for the AVL systems. True to this initial vision, the Ruston campus’ stage is dominated by three fixed 159-inch Da-Lite UTB Contour Screens, which are used as a backdrop for the stage. Content is fed to these three screens via three Epson PRO L1405UNL 8,000-lumen laser projectors. An Apple iMac running ProPresenter is used to send the content to the projectors, and a Matrox TripleHead2Go multi-display adapter is used to split the content onto the three screens. All content for these screens is created in-house at the West Monroe campus. A view from the Ruston campus’ FOH location. Acoustic treatment panels are visible on the sanctuary’s side walls. When the time comes for the spoken-word portion of the service at Ruston, a 220-inch Da-Lite 29453G screen housed in a Wireline Advantage descending case is lowered in front of the three fixed projection screens. (The screen is actually lowered during a dedicated “meet-and-greet” time, which takes place immediately before the main sermon.) 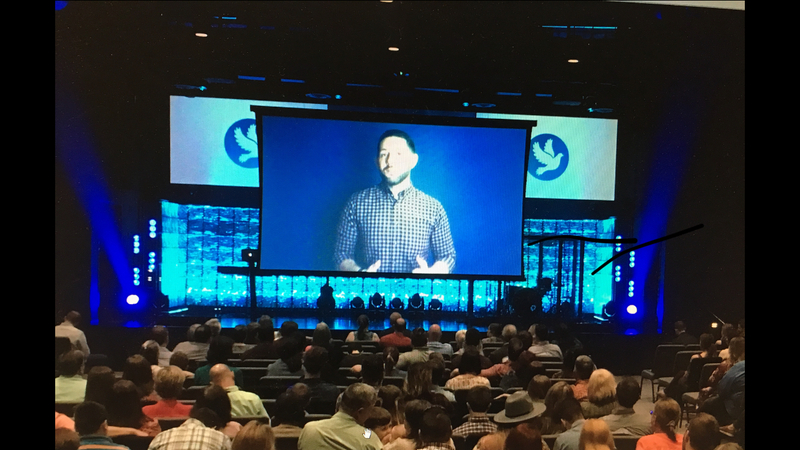 The sermon is recorded at the West Monroe campus using Panasonic AK-HC3800 HD 2/3-inch-chip cameras, which were purchased specifically for streaming video to the Ruston campus. The recorded sermon is then streamed on the large central screen at the Ruston campus. 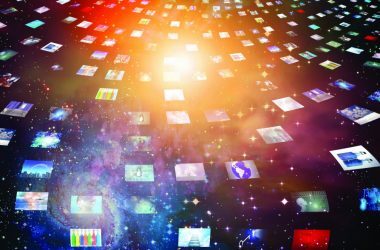 “It’s done on a very tight timeline, so that there’s literally no more than a second gap between anything local and the streamed portion of [the service],” Edwards said. The central screen is fed content by an Epson PRO L1505UNL 12,000-lumen laser projector, which is mounted behind the screen location; the screen’s Dual Vision surface allows this rear-projection setup. The Ruston campus relies on a Haivision Connect DVR cloud-based system to manage the incoming delayed video stream from the West Monroe campus. The DVR/matrix system is the centerpiece of the FOH video distribution system, which is also used to send the spoken-word sermon video to a number of displays located throughout the building. There are four total 70-inch Sharp displays in various locations (one in the main lobby, one used as a confidence monitor hung opposite the main sanctuary stage and two in the children’s area, which is a separate wing of the building divided into smaller rooms dedicated to youth ministry and childcare during services). Two 60-inch Sharp displays are located in the atrium area, which is used for overflow seating and as an improvised cry room. 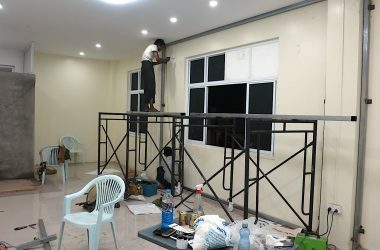 In addition, several 49-inch LG displays are installed in the musician’s green room and various rooms in the children’s area. The back wall opposite the stage also needed some treatment to reduce reflections in the space. “The back wall was really the problem area, which is usually the big problem area in rooms,” Edwards said. “This one was extra problematic because there had been some modifications to the back wall from the original plans. We had to tweak the size of the panels and the location quite a bit to make them fit there but still cover the wall and not look like a hodgepodge.” All the acoustic panels were made by Purdue Acoustics. For the main mixing console, American AVL specified a Yamaha QL5, which is located at front of house. 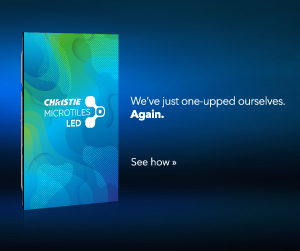 “The main campus still runs an M7CL, so the QL5 was one of the affordable options that we had available. The software and the controls are very similar,” Edwards said. “On the console itself, as far as operation, we pretty much run off one preset during the entire event. There are some things built in—many different EQ settings for different singers and pastors that we can pop in, as needed. The singers tend to rotate each week, so we’ll pull in different processing for them. We’ll have a baseline preset, and then we’ll just alter that slightly each week based on who’s changed out that week.” A Yamaha Rio 32×24 stage box is used for stage inputs, and it sends the audio signals to the mixing console via Dante. Spoken-word sermons are recorded at Christ Church’s West Monroe broadcast campus. They are then streamed on a large central screen at the Ruston satellite campus, nearly in real time. The building’s distributed audio system includes six JBL Control 25-1 wallmount speakers and two JBL Control 26 DT ceiling speakers, which are located in the hallways, as well as two Frazier CAT499 wall-mount speakers, which are located in the atrium. These speakers reproduce the sound from the main sanctuary throughout the building. An additional three JBL Control 29AV1 outdoor speakers are located on the external walls of the building between the main entrance and the parking lot. These outdoor speakers are independent from the main sanctuary audio system, and are used to play ambient music, which is fed from a Denon DN-300Z. The Ruston campus features a dedicated amp room just off the main stage that houses all the amplifiers. A NEXO NXAMP4x4 is used to power the line arrays, whereas a NEXO NXAMP4x1 is used to power the front fills. A pair of Crown CDi1000 amps powers the speakers in the hallways and atrium, as well as the outdoor speakers. The amp room also contains a sound-control closet for housing the guitar amps, which are fed by two Radial Engineering SGI studio guitar interface modules. The guitars are mic’d onstage using two Sennheiser E609 guitar amp mics. The audio signals are fed into a BSS Audio BLU-100 digital signal processor with a Dante bridge to BLU link. “We have pretty much the entire system dialed in in the BSS,” Edwards said. “The NEXO amps have their speaker tunings built in, which gets them to a good starting point, and then we’ll do some adjustment for the room modes, delays, etc. We do all that in the BSS.” He added, “The BSS also allows us to do some of the audio routing. That’s how we discreetly route music to outdoor versus indoor. We actually have a [BSS EC-4B preset controller] with a push button at the front of house that’s just really simple.” The preset controller has two presets for routing signals to the distributed audio system; one sends ambient music and another sends the signal from the mixing console. Onstage, the vocalists use Shure PSM 300 personal wireless monitor systems, whereas the instrumentalists use Aviom A320 personal mixers. In addition to the Rio box, instrument inputs include a Sennheiser E600 drum mic package, the aforementioned guitar amp mics and two Whirlwind IMP-2 direct boxes for keyboards. Three ACE floor boxes and a number of custom XLR patch panels are used for additional inputs and improvised signal routing, as needed. 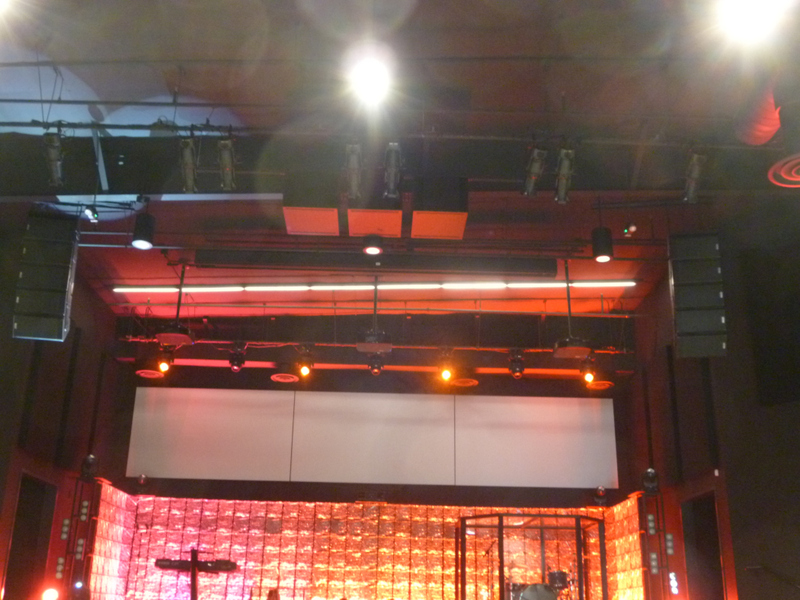 Two line arrays, flown left and right, handle the bulk of sound reproduction for the main sanctuary. The low-end audio is boosted by three subwoofers, which are flown above the stage between the left/right arrays. Three fixed projection screens serve as a video backdrop for the stage. The vocalists use Shure QLXD wireless mics with KSM9 heads, and a Countryman headset is available should the need arise for a locally delivered sermon. A Shure GLXD wireless system is used by one of the band members to relay stage directions and cues to the other performers onstage, as well as front of house. The lighting system is controlled via an ETC Element 60-500 console with two DMX universes. The main sanctuary contains all LED fixtures by Chauvet, ETC and Martin, including 26 movers and 33 fixed lights, plus an Antari HZ-400 hazer.